Bath times can be super-fun for both you and baby, but they can also be potentially dangerous too. The first time you give your little one a bath, it can be extremely daunting. How do you know whether the temperature is ok? How full should the bath be? These are just a couple of the questions that parents worry about. If you want to eliminate the dangers of baby bath time, here you’ll discover everything you need to know. First and foremost, the number one safety rule you should always follow is – Never leave baby alone in the bath. This applies even if you only need to pop to the next room for a towel. Even a few seconds where your baby is alone in the bath can lead to a potentially fatal situation. A good tip to avoid having to leave baby alone is to ensure you have absolutely everything you need before you put them in the bath. It’s also a good idea to understand when you should start giving baby a bath. Ideally, you’ll want to wait until the umbilical cord has gone and healed. Up until this point you can give your little one a sponge bath to keep them clean. Once they are ready to have an actual bath, it’s a good idea to invest in a specialized baby bath. This really lowers the risks as the bath won’t be big enough for your little one to fully fall under the water. However, you still should follow the golden rule of never leaving them alone. One of the main things parents struggle with when it comes to baby bath time, is how hot should the water be? Getting the temperature just right is extremely important as your little one’s skin is really sensitive. The skin is still underdeveloped, so it tends to burn much easier than an adult’s skin. The average hot water heater is automatically set to 140 Degrees Fahrenheit, which worryingly takes just 3 seconds to burn a baby’s skin. So, it’s recommended that you either lower the temperature, or have anti-scalding faucets installed if you can afford it. However, you don’t need to get your thermometer out to measure the temperature. A good rule of thumb is to dip your elbow into the water and check that it feels warm, but not hot. The skin of the elbow more closely matches the skin of your baby so this is the best part of the body to use in order to check the temperature. Run The Cold Water First – It’s a good idea to start by running the cold water and then add hot water to it afterwards. That way, you’ll gain much better control over the temperature. Be sure that the water is mixed and there are no “hot spots” felt throughout. Avoid Having Baby In Bath While Water Is Running – It may seem easier and a lot more fun having baby in the bath while you run the water, however it’s actually really dangerous. The temperature of the water can change very quickly so it’s much safer to wait until the bath is run before placing baby into it. Consider Using Tap Safety Covers – Did you know baby could accidentally turn on the water taps? It’s not something you typically think about, but it can and sometimes does happen. If they manage to turn the hot water tap on, it could cause severe scalding. So, keeping them covered and in turn, teaching your little one not to touch the taps is a great piece of advice to follow. As well as the temperature of the bath, it’s important to consider the temperature of the room too. While baby needs a warm, rather than hot water temperature, once they get out of the bath their body temperature can lower dramatically. So, make sure the room is a nice, warm temperature to prevent baby feeling the cold. It’s also a good idea to have a hooded towel to place them in while they dry. How Much Water Should You Put In? Equally as important as the temperature of the water, is the depth. You’ll find differing advice here, with some experts claiming you should run no more than two-four inches of water, and others claiming you should run five inches. So, which is true? Well, the less water you use, the better. However, you also want baby to be comfortable and not to get too cold. Out of the two recommendations, two to four inches is generally the best measurement to aim for. Deciding upon the right bath time baby products is also an essential part of keeping them safe. Always opt for mild, specialist baby shampoo and soap. Watch out for added dyes and perfumes as these can cause skin irritation. If you notice your little one’s skin is starting to get a little dry, it is possible to add a few drops of baby emollient into the water. However, if you do so, be sure to keep a good grip of baby as the emollient will make their skin a little slippery, increasing the risk of them slipping into the water. Can You Share A Bath With Baby? Once baby reaches around two months of age, it is safe to start sharing baths. However, you will need to ensure you have somebody else in the room so they can hand baby to you to place into the bath, and similarly take baby off you while you get out. You’ll also need to hold baby with you in the bath, rather than having you at one end and baby at the other. This may sound obvious but it’s a simple thing to forget when you’re a first-time parent. 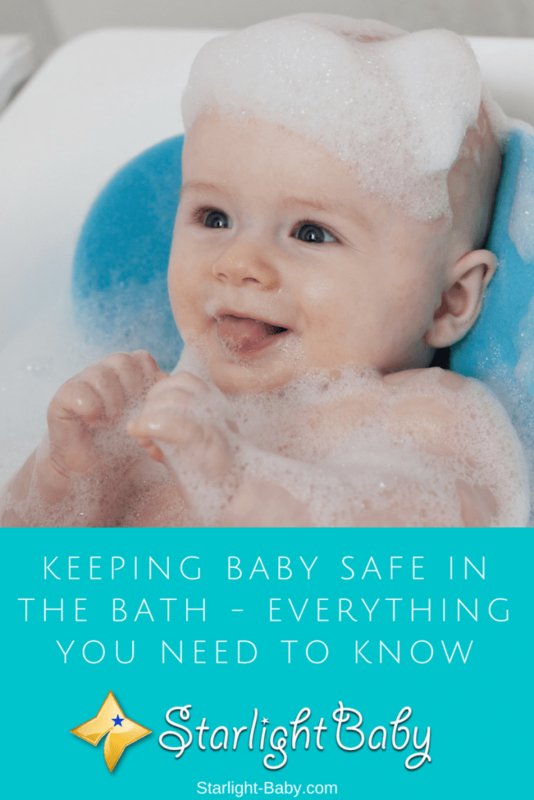 Now we’ve established the most important bath safety information, let’s look at some other, general baby bath safety tips. If you’re using a baby bath, a good tip is to place a bath mat underneath it. This will prevent the bath from slipping or tipping over. If using an old baby bath seat, perhaps one that’s been handed down to you from a friend or family, check online to make sure it hasn’t been recalled. In recent years there have been a few baby bath seat recalls in the United States and other countries due to drowing or other safety hazards. Only buy safe bath toys for babies, as well as baby-safe bubble bath. Certain bubble bath forumlas can increase the risk of UTIs for children under 3 years old. Once baby is old enough to stand, try to avoid letting them stand up in the bath tub. They’ll obviously be excited to be on their feet all of the time, but it does pose a huge safety hazard if they attempt to stand and walk in the bath tub; even when aided. Keep the spout well-covered. If baby does slip, they could easily knock their head on the spout. A spout safety cover is a worthwhile investment. Keep the area around the bathtub clear, especially of electrical objects. So, if you’re used to leaving the hairdryer near the bath, or anything else electrical, now is the time to move it. Your little one will grab anything they can get their hands on so avoid leaving temptation around during bath time. Ensure you’re comfortable. If you’re kneeling on tiles and propping your elbows up on the side of the bath, it’s going to be really uncomfortable. This can distract you and make it more difficult to keep a good hold of baby in the tub. So, fold up a towel and place it underneath the knees. This will not only protect your knees, but also your back. Overall, it can seem really daunting at first trying to learn all of the baby bath time safety guidelines. However, if you follow the tips above you’ll really reduce the risk of anything going wrong. Remember, above all else, never leave your baby alone, even for a few seconds. Baby Ear Piercing – Is It Safe? Baby Friendly Aromatherapy Oils – Are They Safe To Use? Very important article to read. I remember my first time that I bathed my baby and I was honestly terrified. I was so, so scared that I would do something wrong – for example, that I would make the water too hot, that he wouldn’t enjoy it, how much water is enough and more! Luckily my partner is more of the calm one in the relationship and we gave him his first bath together. I loved it when he started to play with the foam and kept laughing. It’s such a wonderful memory. On top of all the good tips you’ve given above, I’d just like to add to try not to overly worry and exhaust yourself with it. Bath time should, in essence, be fun and once you get the basics down and of course, the safety, it will become much more enjoyable for you and your baby. Giving your baby bath can be fun to you as well as your baby (as long as your baby enjoys bath). However, I have never given a bath to my baby. I watch my wife bathing the baby, though. I have never tried to bath my baby because I don’t think I can handle this. My wife always places the baby on a baby bathtub and gives the baby bath with warm water. Our baby enjoys the bath. We bath the baby once a week. How many baths should we give our baby in a week? I think that 95% of babies enjoy having bath, they seem to like it so much. This is evident in how they laugh during the bath, it’s only few babies that normally cry when having their bath. The information provided here is very helpful in ensuring baby’s safety while taking their bath. I find never leaving the baby alone in the bath not even for one split second very important because in a blink of an eye, they may either drown in the bath or slip and hit their both of which are very fatal. Slipping and falling is the main bathing accident that toddlers or babies encounter while taking their bath. This is why it’s advised that parents or guardians take extra care in ensuring they are vigilant while bathing their little ones in order to avoid stories.